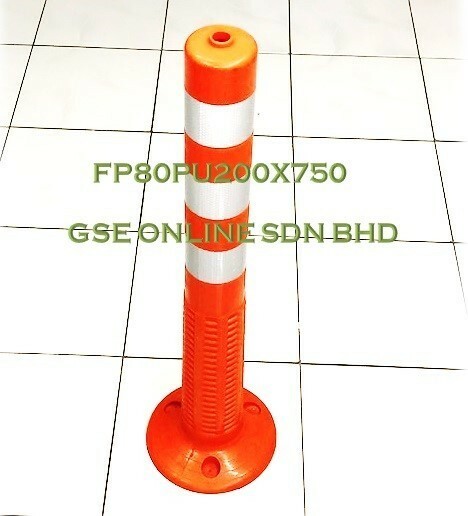 The barrier posts, Ø 80 mm , are made of high flexible polyurethane ( PU ) . Ideal for used to divert road into two parts and give advance warning of a hazard . Driveways , pathways , car parks , housing estate , gas station etc . 2) High Impact Resistance , Flexible post that returns to an upright position even when hit or run over several times . 3) PU has a longer lifespan than Plastic ( PVC ) or fiber-glass composite . 5) Fast and easy installation on any paved surface . Good character of reflectivity based on the unique reflective tape , High Intensity Reflective Sheeting . High Intensity Reflective Sheeting is non-metalized microprismatic lens reflective sheeting designed for production of reflective durable traffic control signs, work zone devices and delineators that are exposed vertically in service. 2) Reflective sheet : White ~60mm x 3 lines . 6) 3 bolts required . 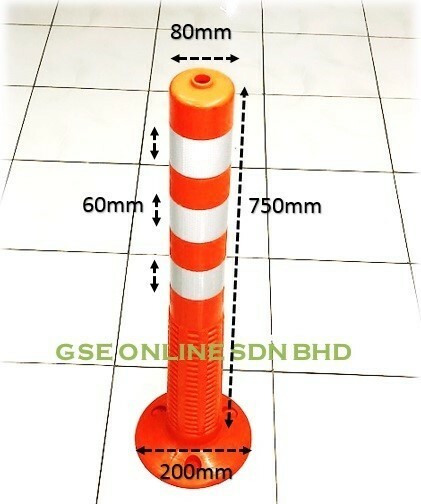 pu Flexible Post / Delineator ?